Santa Monica Press, 9781595800602, 255pp. 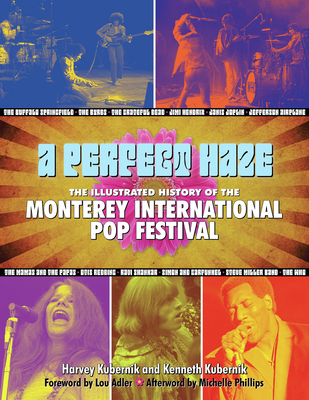 *'A Perfect Haze' is the official history of the Monterey International Pop Festival. The sights and sounds of Monterey come to life in this compilation of photography, memorabilia and first-hand accounts by artists and audience members. Harvey Kubernik has been a noted popular music journalist and record producer for over 30 years. A former West Coast director of A&R for MCA Records, Kubernik is the author of four books, including Canyon of Dreams: The Magic and the Music of Laurel Canyon (Sterling). Kubernik's writings on popular music have been published nationally and internationally in the Los Angeles Times, MOJO, Goldmine, Musician, Melody Maker, Crawdaddy!, the Los Angeles Free Press, and many others. His work has also been included in several book anthologies, including The Rolling Stone Book of the Beats (Hyperion) and Drinking with Bukowski (Thunder's Mouth). Kubernik has penned liner notes on dozens of albums by a diverse group of artists including Elvis Presley, Allen Ginsberg, Carole King, and the Ramones. He lives in Los Angeles. Kenneth Kubernik is a contributor to Variety and is a former editor of Music Connection magazine. He has contributed to the Los Angeles Times and MIX magazine, where he also served as a contributing editor. Kubernik served as an editorial consultant on Canyon of Dreams: The Magic and the Music of Laurel Canyon (Sterling). As a keyboardist and record producer, he has worked on several internationally acclaimed jazz recordings. He lives in Los Angeles. Lou Adler is the legendary producer of the Monterey International Pop Festival. He has also produced for Sam Cooke, the Mamas and the Papas, Johnny Rivers, Barry McGuire, Scott McKenzie, Merry Clayton, Spirit, and Carole King, whose landmark album Tapestry earned Adler Grammy Awards for Album and Song of the Year. In 1975, Adler produced the cult classic The Rocky Horror Picture Show, and in 1978, he produced and directed the movie Up in Smoke, starring Cheech and Chong. Adler owns the world-famous Roxy Theatre on the Sunset Strip in West Hollywood, California. He lives in Malibu. Michelle Phillips is a singer, songwriter, and actress. She gained fame as a member of the Mamas and the Papas, co-wrote their hit "California Dreamin'," and is the last surviving original member of the group. Phillips has also had a successful career as an actress, appearing in dozens of television shows and feature films, including Dillinger, The California Kid, Valentino, Fantasy Island, Star Trek, Spin City, and Knots Landing. She is the author of California Dreamin' The True Story of the Mamas and the Papas. She lives in Los Angeles.